Great insights about studying at Jacobs University Bremen! We are also on Weibo! I went to Barcelona and Madrid this winter with some other Jacobs University students. It was pleasantly sunny the entire time that I was there, which gave me the chance to explore most of the landmarks without freezing in the cold. Barcelona was quite touristy, and has a very artistic atmosphere due to the grand architectural style of one of the most famous Spanish Catalan architects- Antoni Gaudi. Gaudi´s most famous design is the cathedral “Sagrada Familia” which is, although incomplete, listed as a UNESCO World Heritage Site. Construction is still going on and it is estimated to be completed by 2026 the earliest. 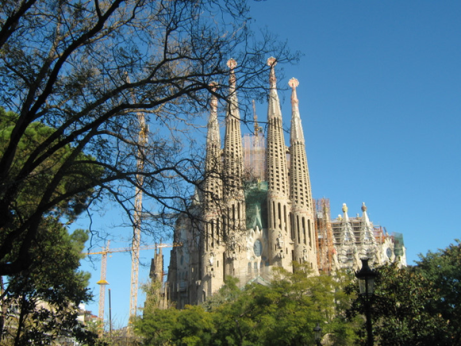 Gaudi’s work can be seen throughout the city in many buildings, cathedrals and parks, Park Guell being the most popular. The city centre has a long street called “Las Ramblas”, lined with souvenir shops and malls frequented by both tourists and local residents. Barcelona has nice beaches, though unfortunately it was a little too cold for a swim. It was very easy to communicate with people as everyone knew English. Like any other metropolitan city, in Barcelona you can see people from all countries and cultural backgrounds, which makes it such an exciting place to visit. Madrid, on the other hand, offers a better insight into typical Spanish life without being overwhelmed by tourists. Finally, I got a chance to practice my Spanish. The Royal Palace of Madrid is the largest in Western Europe and is located close to the city centre. The Sol Square is where most people shop, dine and hang out. On a Friday’s evening, we accidentally run into a red carpet event. I guess you always have to expect the unexpected when traveling. I walked into the middle of a crowd of celebrities without knowing, and was pushed away by fervent fans. Different from Las Ramblas, the Sol Square has lots of street art performers- they either dress up as characters like Captain Jack Sparrow in “Pirates of the Carribbean”, or pretend to be a sculpture. Though Madrid is not blessed with the talent of Gaudi, it is famous for its stunning contemporary architecture. Prado, Reina Sofia and Thyssen are the three major museums in the city. Their influence is recognized throughout Europe in the field of art, and Picasso’s paintings are on display at the Prado. Retiro Park, one of the biggest I have ever seen, is located east to the city center. Comparing Retiro Park and Park Guell you can see the biggest differences between Madrid and Barcelona: Park Guell has more of an artist’s touch, whereas Retiro Park strikes you with its spaciousness, its power and magnificence. In these two great cities of Spain, transportation is fairly easy, efficient and inexpensive. Hopping on and off the metro will lead you to almost everywhere in the city. However, in metro stations and popular tourist destinations, we had to be extremely cautious due to the presence of pickpockets, which both Barcelona and Madrid are infamous for. The airfare in and out of Spain was very low even during holiday season, and no visa was required since I study in Germany- two of the most advantageous aspects of studying in Europe. To conclude, the trip to Spain was my best traveling experience so far, and I am happy that I can share it with you here. Why study Integrated Social Sciences? 1000 Students. 100 Nations. 1 University. Made with ❤ by the Admissions Team!